This website was originally constructed under the framework of EU-funded Integrated Project Euro-Limpacs (EU Contract number GOCE-CT-2003-505540) in 2006. Since the termination of the Euro-Limpacs project (in 2009) substantial data, new concepts and progressed understanding have been gained and published in numerous articles, books and reports. 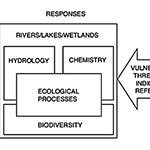 In recent years, several EU-funded projects including WISER, BioFresh, Euro-Limpacs, and currently REFRESH within the EU 7th Framework programme, have addressed the problem of dealing with the multiple effects of future (or current) climate change on freshwater ecosystems and the possible (or evident) responses of biotic components. At the same time a large database on distribution and autecological information of European aquatic species was built and launched (www.freshwaterecology.info). In accordance with the aims of REFRESH the current version of the website gives an overview on the connections between current and future climate, freshwater ecosystems (lakes, rivers and wetlands) and biological elements (algae, plants, invertebrates and fish) that may be effected by climate change. It also includes new information on adaptation and mitigation practices that may be useful for dealing with the possible effects of climate change. Above all it is structured in a way that scientific information is delivered in a more straightforward manner, so students and non-academics could gain access to the main results of current scientific work.